Hopkins is a worsted weight poncho that strikes the perfect balance between cozy and classy. This very wearable piece has been thoughtfully designed with a cowl neck to keep out the chill and cutouts for your arms. 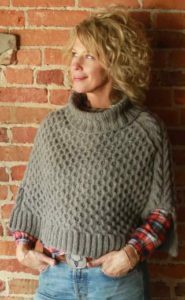 Knit flat for the hem and then joined in the round, the honeycomb stitch, cables, and cowl neck all work together to create a knitted item that will become a fall favorite.